Entrance exam preparation is costly and not exactly what I’d call fun. A company that launched on Monday called Grockit is dropping costs and making the process a bit easier to get through. Grockit was started by Farbood Nivi, who has been teaching exam preparation since 1998. He worked for Kaplan and was Teacher of the Year for The Princeton Review in 2002. 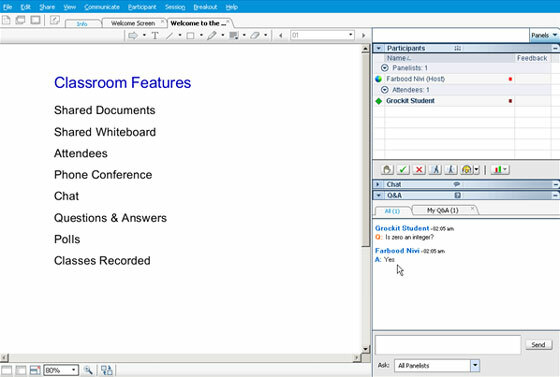 Just a few months ago he decided to start his own prep school where students can attend WebEX classes. Grockit is significantly cheaper than the major review schools but Nivi says his profit margin is bigger. To start out, Grockit is offering 16 90-minute sessions plus the official GMAT review text books for $399. Kaplan online is $1,249, The Princeton Review is $899, and Manhattan GMAT Prep is $990. Nivi says that the Grockit price may go up a little within the next year but he doesn’t have actual plans to increase it. To promote his service, Nivi and his staff of teachers have signed up as experts on BitWine. They are also banking on word-of-mouth marketing, hoping that saving money is a major incentive for hopeful students. The obvious question here is if Grockit is a get-what-you-paid-for type deal. Having not taken entrance exams in six years, I couldn’t think of appropriate questions to quiz Nivi with but his experience is impressive enough to say his school is worth serious consideration. Especially for anyone considering dropping major ducats on an MBA.